Despite its simple gameplay, it's quite interesting that this game came out as pretty fun, entertaining and yes, a bit addictive. 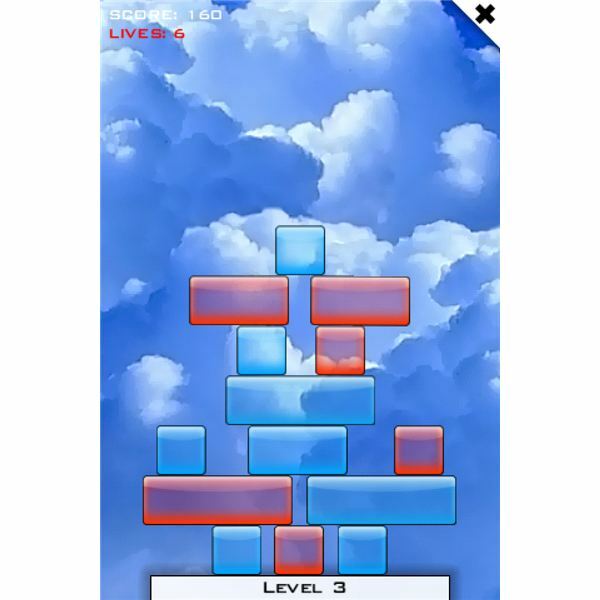 The game gives you several blocks which are either blue or red. These blocks are arranged strategically in relation to each other. The blocks are also of different sizes and orientation – meaning some are positioned vertically or horizontally. The objective of the game is to break the blue blocks. You'll earn 10 points for every blue block you break. Sounds easy? Actually it gets quite challenging if you take into account the red blocks. That's because you must avoid breaking them while trying to break all the Blue blocks. Of course, that is not always so easy because the red blocks are either on top of, or below the blue blocks. There lies the challenge of the game. At the start of a level, you are given 10 lives. You lose a life every time you break a red block. Lose all your lives and the game is over. So, to complete a level, try to break all the blue blocks with as few red blocks broken as possible. In addition to the red blocks, there will also be some black blocks which can't be broken. So, this adds some difficulty in some levels. There is also a green block which you can't destroy with a single tap, but you will have to make them fall off the platform. Somewhere along the way, you'll get some bonuses that appear on the sides of the platform. You can use these bonuses by tapping on them. These bonuses can either be extra lives, the ability to switch block colors, or control gravity, which makes use of your iPhone's accelerometer – that is you need to tilt your phone to control said gravity. 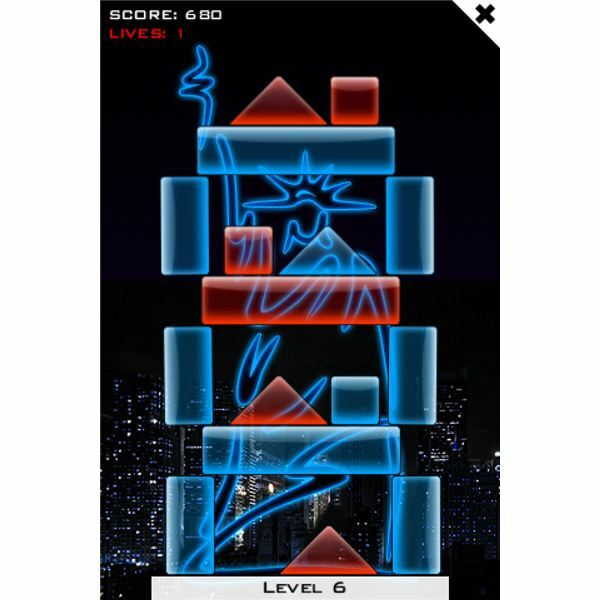 Glass Tower 2 is one of the best iPhone games that relies on game physics. If it weren't for its great game physics, this game would not be as good as it is. The game developers probably anticipated this and made sure that every object in the game would react and respond to every action in the way that it should do. 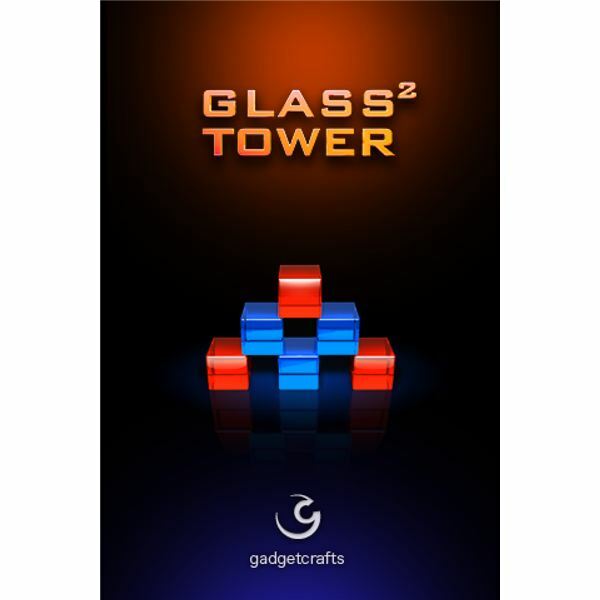 The glass towers breaks beautifully, with the broken glass pieces shattering flawlessly. To add some nice effects into the game, cool, realistic glass breaking sounds were also added. Alright, I admit – when it comes to graphics, game physics and sounds, I can't think of anything negative to say about any of these aspects. You might think that with all the nice comments that I wrote previously about this game, I would give it an excellent rating. Unfortunately I could not. Don't get me wrong, I really like the game for all its great features and the efforts put into it by the game developers. What I really don't understand is why offer it as a free iPhone game at first, play several levels, and then right when you're hooked… the game will require you to purchase additional levels. If the game developers wanted to earn from the game (which they have every right to do), why not just put a price on the game from the start? I don't know, maybe it's me – but I just don't appreciate this strategy. I would have paid for the full version of this game with all the levels, for whatever it's worth. Just don't tease me with a few levels and lure me into getting more by spending more. With that said, I would still recommend this app. It's a great, simple and yet pretty addictive game. In fact, it was so addictive that I purchase the first "premium" pack. Hopefully, that's where my addiction to the game ends. If you like puzzle block games like this one, then why not consult our list of free Tetris clones. Image credit: Screenshots of Glass Tower 2 provided by the author.